Meta Info | Collect the Metadata information to improve the user experience. Meta Info: Defined, Explained, and Improved by DVDFab! Meta Info, or Metadata for a Blu-ray movie disc means all the basic information about the disc and its contents: title, runtime, audio/video formats, genre, director, actors and so on. Useful information, but not deep enough for most DVDFab users and that is what the Meta Info feature is all about. We have all experienced it, you open DVDFab and put in a shiny new Blu-ray for analysis, copying with Blu-ray Copy or ripping with Blu-ray Ripper, only to be met with a huge list of titles, some long, some short, and the only way to tell what they are is by previewing each one--time consuming and frustrating. This new feature ends all that, with a cooperative effort of the DVDFab Meta Info Team and Fab's worldwide base of knowledgeable users, just people like you who need the same facts you need to manage what you want to do with the disc. And now they can upload all the details to the DVDFab Meta Info server and you will have it on your screen as soon as the disc opens! Which TV episodes are on this disc? No problem! What is that 29 minute title? No problem, Meta Info will tell you all this and more. Like having someone who has watched the disc 100 times sitting at your elbow to advise you! All that time you would have to spend sorting the junk from the valuable content is a thing of the past, already done! You can simply look it over, select what you want, and press Start. And for ripping TV episodes, nothing could be better. 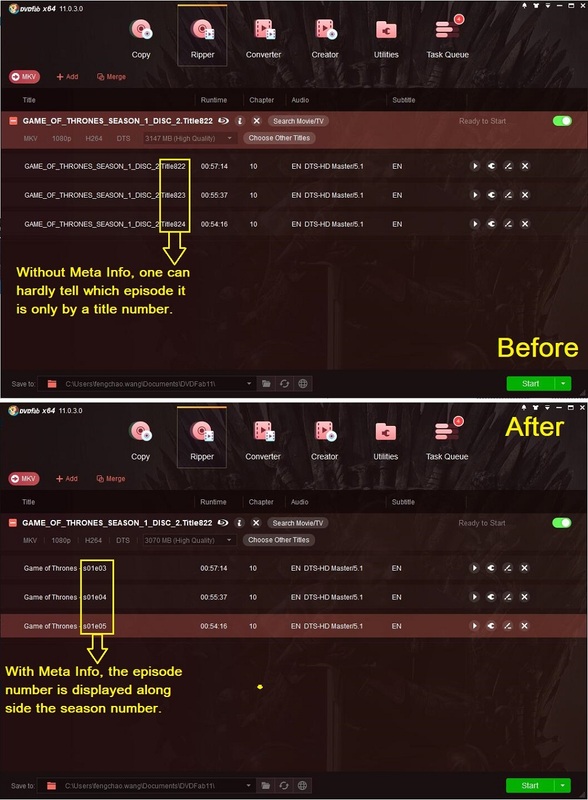 In Blu-ray Ripper, Meta Info names each episode With the Show Title, Season and Episode Number so that your Media Server (say Plex or VidOn) or Player lists them clearly for effortless browsing and playback. See the illustration below for an idea of how great this will look on your screen. Step 3 – Preview the information you've entered and then upload. DVDFab has provided the bedrock that Meta Info will rest on and now the final destiny of the feature is in the hands of those that will use it. Although it is up and running with several thousand titles in the database, there is still a long journey to make it full and useful to everyone everywhere. We hope you enjoy using it and also that you will join in uploading new Meta Info for everyone to use. In gratitude for those that do join in the continuing project, we also have some incentive plans.